One never knows what winter will bring in terms of Vancouver’s weather. Rain? Well, duh. Snow? Surely. Wet snow in abundance like we had last winter? Please, not again. A long and penetrating deep freeze? Possible, but let’s hope not. Such are the vagaries of the jetstream, the Arctic vortex and the La Nina/El Nino currents as they interact with the geography of the southwest coast and the micro-geography of the Botanical Garden. Our weather is always full of surprises. Which is, I suppose, why people talk about the weather. 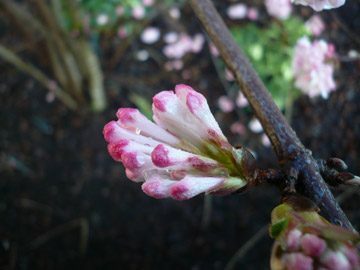 Related to these phenomena are patterns of flowering (the timing of flowering or other developmental events as they relate to weather is called phenology), but the correlation between flowering and weather is not as direct as some would imagine. Many plants are genetically programmed to be cautious (for want of a less anthropomorphic term)—only flowering when it is safe to do so and conditions are ideal. Others, like Viburnum x bodnantense (Bodnant viburnum) (Winter Garden, Entrance Plaza), Berberis x media ‘Charity’ (hybrid mahonia) (Contemporary Garden, Reception Centre Plaza), Sarcococca orientalis (Chinese sweet box) (Asian Garden entrance) and Chimonanthus praecox (wintersweet) (David C. Lam Asian Garden Upper Asian Way, Winter Garden) will dependably produce their fragrant flowers in mid winter, even when the mercury has been hovering around the freezing mark for weeks. Most plants that normally flower at this time of year can take a few frosty nights on the chin. Still, when ground temperatures drop below minus 2 or 3 C (28 to 26 F), all bets are off. Nevertheless, I’m gambling that these shrubs are going to be beautiful for much of January. Besides the more impetuous viburnum, sweet box, mahonia and wintersweet already mentioned, there are plenty of cautious shrubs, which don’t generally open without a long, mild spell first. Come back in February or March when those should be in bloom. 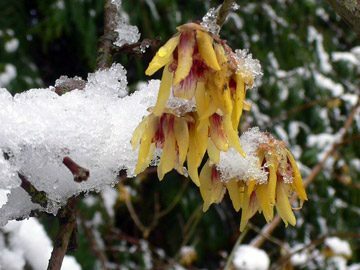 Another category of winter-flowering plants includes those that are normally spring-flowering, but that occasionally open flowers abnormally early. 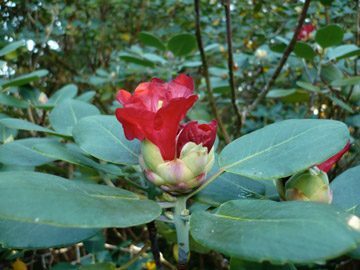 Among these unanticipated bloomers are a number of rhododendrons, including, commonly, Rhododendron thomsonii (Asian Garden, opposite the Moon Gate) which has crimson bells, and the dwarf R. hanceanum ‘Canton Consul’ (Asian Garden entrance) with small, creamy yellow blooms. These seem to open a flower or two (seldom a whole truss) at almost any point during the fall and winter, barring prolonged freezes. Worth mentioning, too, is Berberis darwinii (Darwin’s barberry), an April-flowering beauty, currently in partial flower in the E. H. Lohbrunner Alpine Garden (South American section). Its beautiful vermillion- and apricot-orange flowers are a magnet for our resident Anna’s hummingbirds. Great read! really informative and useful. 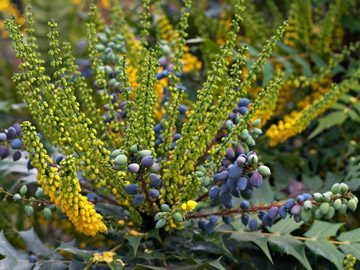 According to most botanical authorities, Mahonia is no longer a valid genus and Mahonia species are now referred to Berberis. Despite the apparent distinctiveness of the cultivated mahonias and barberries, a broader analysis shows that there are species that overlap in a number of features. Indeed, the unusual Berberis floral structure—six sepals, six petals and six stamens—is common to all species. Amalgamation of the two groups is nearly universally accepted by botanists and is an approach borne out by recent molecular genetic studies, but the horticultural literature does not necessarily reflect these changes, and many gardeners and authors are reluctant to recognize the change. Have all the Mahonia been reclassified as Berberis? I learned something about the beauty of a winter garden. Thank-you, Amrita Duperreault. Well thought out prose. This is great- current movement in the garden: Rhodos, Mahonias. How about Mahonia+ Anna’s Hummingbird! All better than exotics that usually appear with foreign(Latin) names. You brighten my cold dreary rainy day!